Here is another fan suggestion! When we asked our followers on our Facebook page what flavor combination they'd like to see next, we got a lot of awesome suggestions- and we've been working hard to make them come to life! Pink Lemonade was so neat and different, and so very very summery- we just couldn't resist. Shown is a Pink Lemonade Cupcake and Tini! 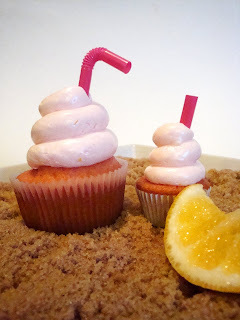 I started with a cake that incorporates all the flavors you'd find in pink lemonade- including lemon, fresh zest and juice from organic lemons. I then tinted each cake the very sweetest color of pink. Next I frosted each cupcake with a pink lemonade flavored buttercream frosting and match the pink color palate. Finally I topped each with a tiny straw to really create that summer drink appeal.